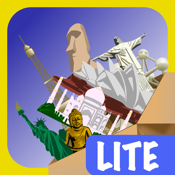 World Landmarks Quiz is the ideal game to play while you are standing in line waiting your turn. Play and test your knowledge about World’s most famous monuments and landscapes. To the travelling lovers, it’s an opoprtunity to remember the visited places and identify new ones to visit. -With 20 amazing levels available, in the full version, the goal of the game is to identify the place where each picture presented belongs. Every time you got a right answer you will be rewarded with useful information about that landmark. The faster you are, bigger will be your score. -Play and show that you are an expert reaching the highest score of all the players.